Smoking is among the most significant risk factors for gum disease and can reduce the effectiveness of treatment. Periodontitis is an advanced form of gum disease in which the gums separate from the teeth, allowing bacteria to grow below the gum line and break down bone and tissue. Periodontitis is irreversible and can lead to tooth loss. 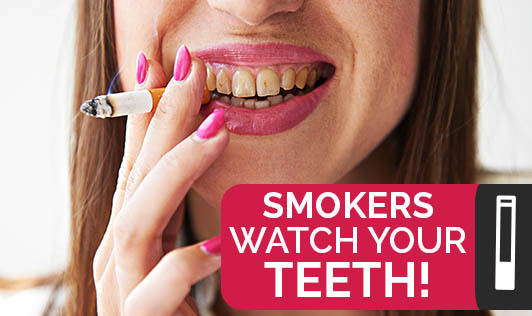 Tobacco is a major cause of tooth staining. While not dangerous, tooth discoloration can be unsightly and is often perceived as unattractive. It is an unbearable type of pain affecting the oral cavity, teeth, jaw or face. While the exact cause is not always apparent, oral-facial pain may result from gum disease and other dental problems caused by smoking. Smoking is associated with increased incidence of tooth sensitivity, mouth pain and facial pain. Tobacco contains a number of chemicals known to cause cancer in humans. Smoking puts these chemicals in contact with the body, triggering cancer growth. All types of tobacco - including cigarettes, chewing tobacco, gutka, zarda, cigars, smokeless and pipe tobacco - increase the risk for developing oral cancer.